One day I noticed that Mesa was getting around faster and realized that she had suddenly sprouted legs. It was like a cartoon. One moment she was a guinea pig without legs, and then - there was a pop! And she sprouted legs! "Even I don't believe that." Regardless of when they appeared, they did, and Mesa the Mogwai Monster Minion is suddenly a very fast-moving twister with a mind of her own. Yes, a twister, that pretty much descibes what it's like to keep up with her. And the twister has 4 wheel drive. 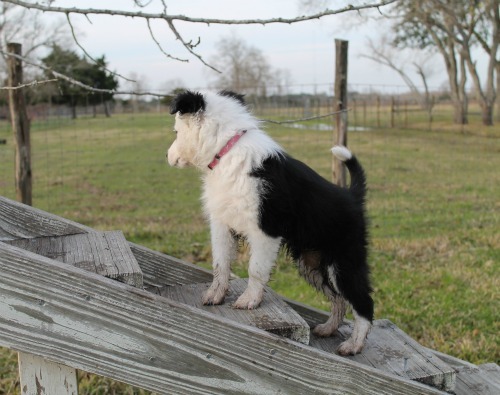 The day she came home, I placed a board on the back of the flatbed trailer and every morning she climbs the board to survey her tiny kingdom from the top of the trailer. 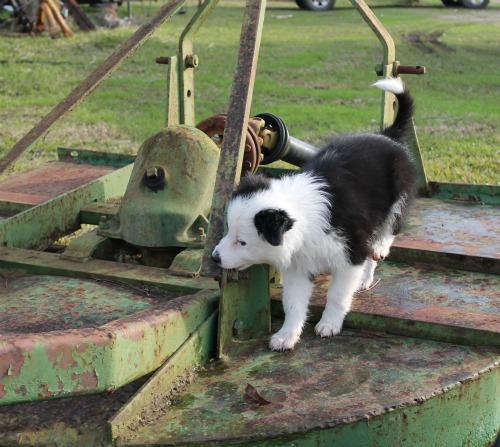 She also enjoys exploring the area in the side yard which houses all the farm equipment. 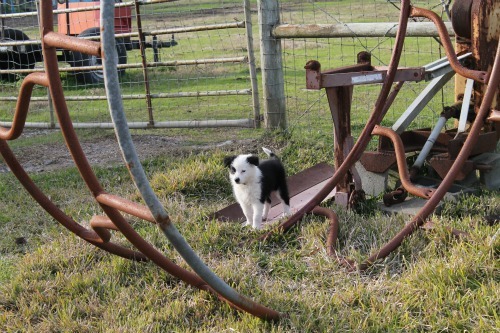 Just like baby goats, baby Border Collies love this jungle gym. I was busy snapping pictures when I realize the little beast was shooting to the top of an old dog walk. This was the first time she had ever shown any interest in the old thing. 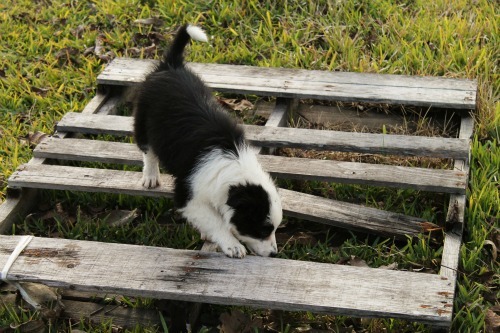 The ramp has become disconnected from the top so she thought everything was fine until she got to the top and realized that was as far as she could go. 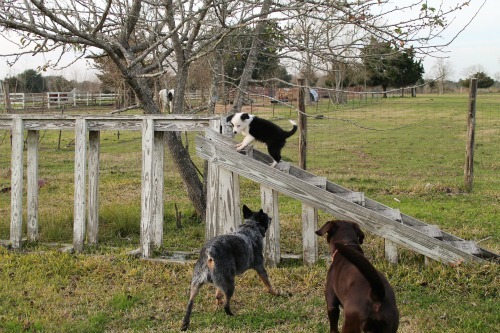 I hustled over as fast as I could move without trying to make too much of a fuss lest she bail off the top. 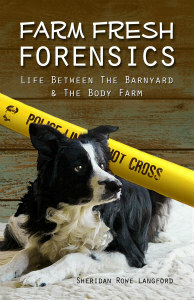 Dillon and Ranger were already on it. No, I hadn't said a thing to them. The adult dogs just recognized she had a problem and rushed over there. I joined them and she got herself turned around. Then she climbed back down, turned around, and shot back up to the top. Monster likes climbing. Monster likes giving me gray hairs. While I appreciate her boldness, this is definitely not an obstacle I want her playing with at her age. Too much risk, too much strain on her growing body. So this will be her last view from this height for a while. "LOOK! 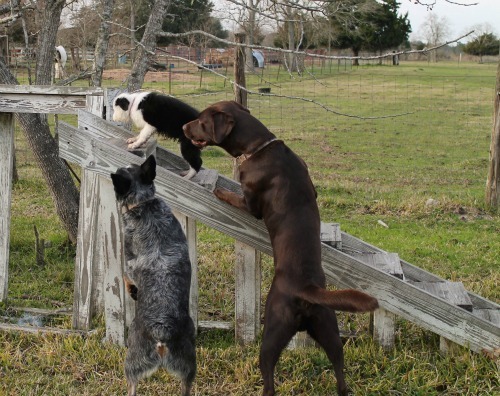 You can see the sheep from here!" Sheesh! 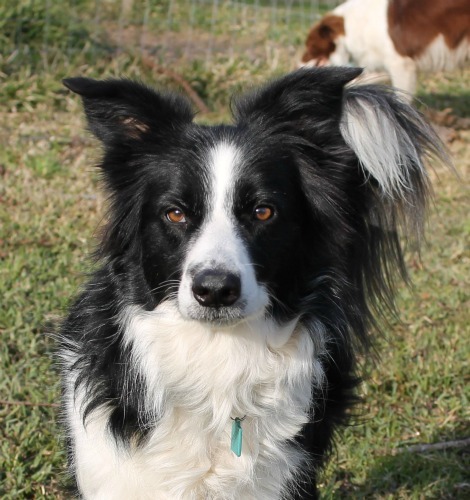 My 3 year old just decided, yesterday, that I wasn't out to kill him by trying to encourage him to try the dogwalk. We've been trying for about a year and a half. 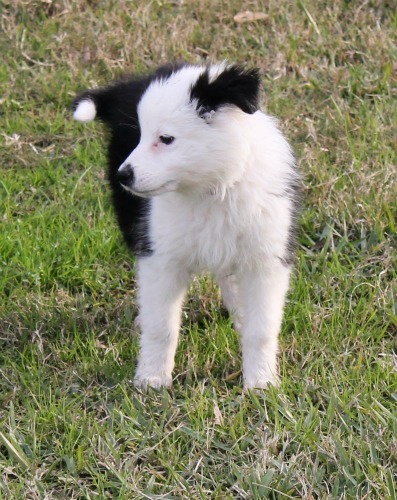 I love how puppies just seem to sprout legs one day. Then the real fun begins! The dogwalk plank isn't as narrow when you're tiny. 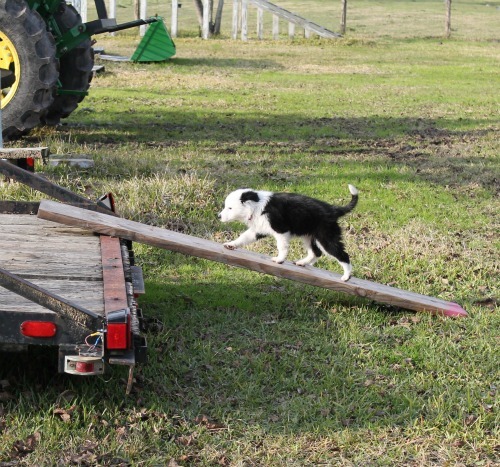 That's why I put the plank on the flatbed trailer for her to practice climbing now. 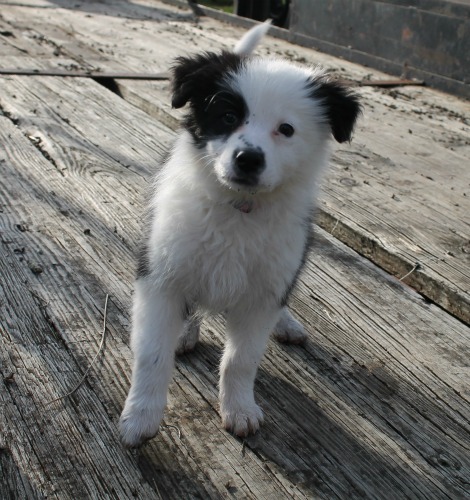 As she grows older she will learn to accommodate her stride to the boards as they get more narrow when she grows wider. 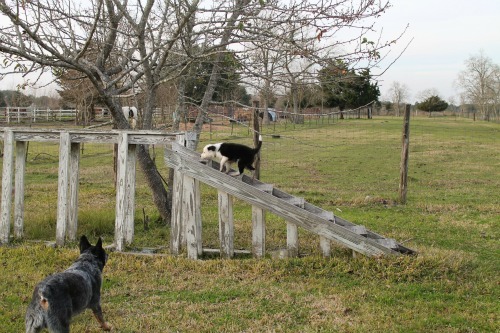 Bigger dogs have to re-learn how to walk to effectively handle the narrow beam.